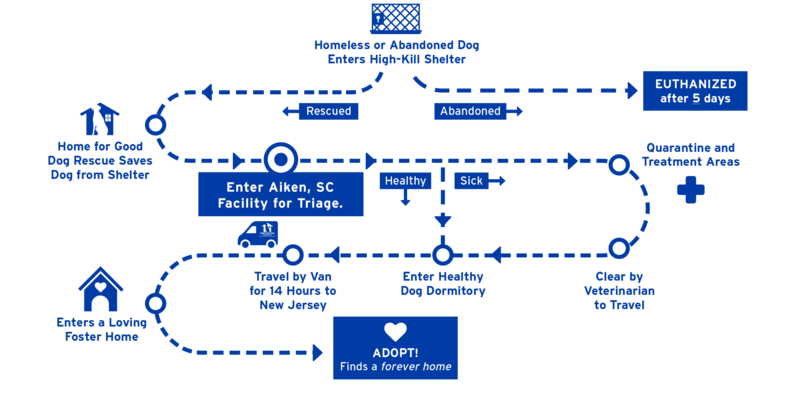 Once a dog comes into our care from either an owner surrender or a high-kill shelter, it enters our fully staffed rescue facility in Aiken, SC and is completely vetted with the help of a third-party veterinarian. Our property in Aiken, SC serves as the all-important halfway point between our dogs’ pasts and bright new futures. There, we boast a newly renovated kennel, quarantine areas, and full staff composed of attendants, a veterinary technician, and veterinary assistants, all of whom are responsible for the well-being of each and every one of our dogs. Our staff arrives promptly at 7 AM each morning, and they feed, socialize, and begin training each dog in preparation of finding their forever homes up north. Our fenced-in property, which spans 10-acres purchased by an anonymous benefactor in 2014, allows each dog the opportunity to run, play, and grow in a safe environment under the supervision of our professional team. Once a dog is medically cleared and well enough to travel, they arrive in New Jersey via either overnight transport van or volunteer rescue flight. The arrival in New Jersey occurs promptly at 6:30 AM, and our northern volunteers greet the dogs at our facility in Berkeley Heights and bathe, feed, and photograph them in preparation of sending them to their foster homes.